Originally written and published in 2014. It is hard not to feel disgust and anger at a group like ISIS as it fights its uncivil war across Syria and Iraq with such a murderous disregard for human life. Such an organisation unfortunately is not a new occurrence and radical groups or individuals performing menacing and terrifying acts against other human beings is as old as time itself. Violent wings of an ideological group, however related or co-ordinated to the main body, is also something that is not new. Yet why is it that time and time again we in the West continue to find new enemies which, in many ways, we helped to create? Our collective society has a habit of ignoring the repetitive back blast of history which often seems to thump into the Anglo sphere with a vengeance. This ‘blowback’ as such was most recently experienced in the form of Al Qaeda. That radical Sunni militant organisation formed from the ‘heroic’ elements of the Mujahedin who according to the Cold War narrative fought so valiantly for their ‘liberty’ against the menacing Soviet Bear. An evil Soviet Union that so inserted its imperialist claws into Afghanistan during the 1980s in an attempt to create a secular and stable nation in their own image. Many of the groups that made up the ‘Mujahedin’ were not organic to Afghanistan, but were a formation of Arabic internationals, many of which were supplied and trained by the United States in an attempt to bog the Soviets down in their own ‘Vietnam’. The Soviet Union grappled for control and struggled with the task of nation building much the same way that the United States and NATO would some two decades later. The historical narrative at the time was that the Soviet Union was facing an organic army of hills people who were much like the American founding fathers, at least so the American populist mantra went, fighting with God on their side and for the right of self determination. The Arab internationals were in many ways seen as the Abraham Lincoln brigade of Spanish Civil war fame, adventurers and interested heroes volunteering to fight the might of tyranny in faraway lands. The inevitable reality however would lead to a civil war once the Soviets left which in turn lead to the emergence of the Taliban. For all their faults the Taliban were welcomed by many in the war fatigued populace as an alternative to the many corrupt war lords, international factions and the former decayed socialist regime of the 1970s. Instead the Taliban emerged with much help from Pakistan as an organic decentralised power base which merged to tribal customs with strict Islamic virtues. Fast forward to the collapse of the Twin towers and the attack on the Pentagon, it now appeared that the Sunni terror group, so heralded during the 1980s by the Americans was responsible. Al Qaeda and its associates were not unknown players on the world stage, they had become motivated in attacks on the United States after the occupation of Saudi Arabian territory, holy and sacred earth to many of the Sunnis. Just before the first Iraq war in 1990 when Iraq threatened the Saudi Kingdom, Osama bin Laden, the heroic veteran of Afghanistan’s struggle offered to send his experienced fighters to the Kingdom in defence of the holy sands. Instead the monarchy enlisted the support of the United States, and so it was that American boots should set foot on the sacred earth. It would appear to many radicals that the Crusaders had returned to the Islamic Orient. A great insult and threat to many in the region but especially to Osama bin Laden and his warriors. Osama Bin Laden, a native of the Saudi Kingdom saw this not only as a terrible thing but also as a new focus for his network of radicals. And so thereafter the group slowly intensified its attacks on American targets, its zenith being the terrible attacks in September of 2001. And despite the escalation and rhetoric thrown towards the United States during the 1990s, Osama bin Laden only gradually moved from a romantic caricature portrayal of a Cold War warrior to a dangerous terror mastermind. The Taliban regime of Afghanistan having refused to give up Osama bin Laden to the United States after he admitted his part in the 2001 attacks, remained vigilant. It was then that a US lead invasion of Afghanistan commenced in 2001. Working in coordination with Iranian intelligence and the pro-Iranian Northern Alliance the US coalition swept through Afghanistan overthrowing the Taliban and ultimately installing a ‘democratically elected’ regime of corruption under Hamid Karzai. And over a decade hence the turmoil and instability of Afghanistan is still ever present as a civil war wages and the Taliban with Pakistani support struggles to regain control over the troubled Central Asian region. Thousands are dead and millions are displaced as the NATO and US forces meander politically without a clear objective other than a failed plan to nation build. This faltering policy and incoherent goal not only betrays those operators in country, the very citizens at home in which they apparently serve, but also those who have given their lives. After the September attacks Iraq soon became the main focus of the United States, despite the regime having no links to Al Qaeda nor any intentions to strike at the United States. Despite the US sanctions and continued air strikes against the Iraqi’s leading to hundreds of thousands of deaths through starvation and from bombings which had been a constant reality to the region since the end of Gulf War One. In an attempt to gain wider International support the American regime under Bush Jr, went into Mesopotamia under the pretence that Iraq possessed dangerous weapons of mass violence which stood to threaten the World. And we soon learned that this was all just another myth. If the invasion was so noble and inspired by the threat of a ‘rogue’ state which so represses its people while being in the possession of weapons of mass destruction, then why have these so anointed powers of the Anglo sphere not attacked and toppled the North Korean regime. Thousands die each year at the hands of this lunatic regime, its nation is a virtual prison State, it possesses a well armed highly motivated army poised to leap into neighbouring South Korea and its constant arms race is both advertised and well known. So is the constant rhetoric and threats of violence broadcast non-stop from the North Korean capital and yet this fellow pariah state enjoys its own fulfilment as a bastion of tyranny. Pyongyang continues to thumb its nose at the West. After the initial conventional campaign was over and most of Saddam’s conscript army melted away into prison camps or the countryside, the US lead forces proclaimed victory. Now the insurgency would begin. The chaotic mess of occupied Iraq was now open to various local and regional factions to battle it out amongst themselves as well as against the new foreign occupiers. Iraq, a nation based within fictitious borders drawn up only recently by the victors of World War One, as European fingers clumsily drew into the sand of the old Ottoman Empire and expected the locals to so abide. Despite these international borders, the people within crossed them regardless and lived for the most part according to their traditional ways. It was only when the various national regimes imposed terrible wars or sovereign heads of state enforced policies of terror upon the people did they feel the true legacy of such post World War One arrogance. One such faction which found itself in Iraq after the 2003 invasion was the Sunni terror network, Al Qaeda. It now had a new battleground upon which to operate, one which was ripe to recruit locally from the dissatisfied Iraqi populace as well as to inspire foreign Moslems to the fight as the Americans all too willingly played into their propaganda of prophetic anti-Islamic brutality. The occupiers acted with callous insensitivity on every level. It truly would seem in both language and action that the Crusaders had returned. Arrogantly, the United States invested so much blood and capital into a toxic alchemy of nation building, a thankless and fruitless task only benefiting the corrupt and opportunistic, all too eager to exploit American energy to ‘fix’ and ‘heal’ Iraq. It was not solely the surge or the American focused operations at the time which ejected Al Qaeda, but it was many of the tribal groups from within Iraq. The local peoples becoming wary of the foreign Al Qaeda which grappled for control over the many factions, especially as a lot of Al Qaeda’s goals went against the self interest of the other groups. Because of this it was from within, locally that much of the effort to marginalise Al Qaeda inside of Iraq was achieved. And despite this rise of tribal will against the foreign fighters, it was the US political masters who proclaimed victory. Regardless the calamity that had been created in Iraq continued and violence sustained, even after President Obama removed US troops and declared Iraq as being ‘fixed’ and democratic, able to defend itself on its own. Wishful thinking given how much effort, lives and capital was invested into such an objective. Colonel Muammar Gaddafi had been in and out of favour with the West for most of the period of his rule over the small North African nation of Libya. As the Brother Leader of Libya he had been a convenient scape goat for much of the instability and terror throughout the world. Whether he was all that he was accused of was not helped by his support of near every National Liberation movement during the 1970s and 80s. His nation suffered the wrath of American sanctions and bombing attacks. One such attack in 1987 lead to the murder of his sleeping baby boy. Gaddafi was a charming, violent, intelligent and brutish man, his regime reflected much of this. By the late 1990s the Brother Leader had become a reformed player and by 2001 he was a sympathetic ally in the new war on terror. His regime managed to go through all of the hoops in order to get the sanctions lifted, he said the right things and condemned the new enemies of the United States. It seemed that the Emperor was wearing new clothing which satisfied his new tailors the most. The former torch bearer for global terror and the long time financier had seemingly switched from Colonel Gaddafi to the new face of menace from Saudi Arabia, Osama bin Laden. Despite his new found romance with the West and most importantly the Anglo-Sphere, Gaddafi would be one of the despots who suffered in the fervour and revolutionary touch which had begun in Tunisia. Inspired by the recent Wikileaks cables, the release of information pertaining to much of the corruption and deviate decadence of the various National Governments, the Arab Spring surged organically from within the discontent of the people with their despotic rulers. In some parts the fires of revolution were fanned from interested parties from the outside. Libya soon felt the surge of revolution and for the most part it contained it. Recently before the Arab Spring, Gaddafi had expressed that he wished to create a new gold backed currency to help his country and much of Africa. No longer would oil, minerals and the like be traded for with the Euro or in American dollars but instead, Gaddafi had hoped, Africa would use this Gold Dinar. Many have speculated that this currency would have devastated the US dollar which has continued to lose its value, in no short part to its own domestic Governments many inflationary and debt filled policies. So the stage had soon been set, as the war drums began to slowly thump. Gaddafi was all that he had long ago been accused of being and revelations of terrible repression soon began to fill the media. The terrible regimes in Egypt, Bahrain, Tunisia and Yemen, not to mention the many other regimes of oppression soon began to enjoy little or no coverage on the generic media. It seemed the focus was Libya. Political leaders of the Anglo Sphere invoked Gaddafi hate not seen since Ronald Reagan sent F-111’s over Tripoli to bomb the dictator into global obedience. The instability soon saw foreign volunteers crossing the border. Al Qaeda was one such group which found itself in the sands of Libya. The United States determined not to have American boots on the ground began to recruit locally, finding many willing volunteers, young unemployed and dejected men soon came into their employ. Frustrated reactionaries eager to find a cause and purpose, motivated by faith and local ideals, these men were soon trained in NATO camps and became many of the revolutionaries fighting for a new Libya and others were simply local mercenaries, newly recruited. As Gaddafi attempted to defend his crumbling regime with his Nubian mercenaries, the United States was sending in its own mercenary army of ‘Rebels’. Gaddafi was soon dead and Libya, though nowhere nearly as tumultuous as Iraq soon fell into a bloody ocean of calamity. Leading to the death of a US Ambassador when a violent group stormed the poorly defended US Embassy in Tripoli. Just like in Iraq and Afghanistan instability and violence would stir daily from within Libya. And just like in Iraq, foreign fighters found themselves in a Balkanised conflict as groups jockeyed for the control of infrastructure and territory while the locals suffered. Bashar Al Assad was the unlikely leader of Syria. The younger son of Hafez al-Assad the Baathist leader of Syria. Like most Baathist dictators Assad the elder had nationalised much of the industry of his nation and ruled with tightly clutched hands. As one of the many post-colonial era despots that had risen to prominence during the 1960s and 1970s. He soon found a close relationship with revolutionary Iran and the Soviet Union. His eldest son and heir apparent was killed in a car crash and so his younger son, Bashar, a recent graduate from medical school in the UK was flown back to Syria where he would learn the ways of leadership. The inevitable heir to his father’s ‘kingdom’ that time would soon arrive. The Arab Spring reached Syria, and Assad’s regime was soon under threat of being toppled. Much of the violence in Iraq had not stopped at its borders with Syria. Just like Iraq, Syria was a recent post World War One creation and a former French colony. As a key partner with the Iranian regime in both regional matters as well as in the few foreign adventures in which the two had participated. Namely their involvement during the civil war in Lebanon,where both nations had supported and sent fighters to fight local militia groups as well as against the Israeli invasions-occupations. Syria was also one of the few foreign ports and bases for the Russians. It had been a key military platform in the region for the Russians even in the post Cold War period. Even in a period of great strategic recession for Russia, Syria provided Russia a port and bases ensuring their ability to observe and project themselves both defensively and offensively in this crucial region. Syria it seemed was a target by proxy for the Angosphere. It had two powerful friends who would suffer if the regime should find itself overthrown. The civil war was a perfect pretext by which to install a pro-Western regime, at least this was hoped so long as the West should support the ‘Free Syrian Army’. This army which was made up of varying interests, it was an ‘Army’ mostly in name. The US and UK were all too eager to send a military force into Syria. Again this Free Syrian Army was sold as the liberating force fighting a mighty and oppressive regime, just as the Mujahedin had been against the Soviet Union. Soon it reported chemical weapon attacks on Syrian civilians by the Assad regime, despite conflicting neutral reports suggesting otherwise. The Assad regime attempted as best it could at international transparency, as Gaddafi had earlier. But atrocities from the Assad regime were ever apparent in the western narrative as media talking heads and public officials decried the terrible acts of horror being inflicted on the people by Government forces. All the while frightening revelations were soon trickling from the war zone about the rebels and their acts of horror. Yet these were marginalised and all but ignored by those War Hawks in Washington and London. Images of the Syrian rebels cutting the hearts from conscript soldiers’ chests and eating them, beheadings and executions so blatantly recorded and uploaded became more and more common as the rebels began to take on a new character. Despite what the Anglosphere’s political elites were attempting to sell, the real nature of many of these rebels began to appear. Al Qaeda soon found itself in action but began to find conflict with this new group. Condemning them for their blatant slaughter of fellow moslemsand going so far as to accuse ISIS of being far too extreme even by their own standards of terror. Many of the NATO trained revolutionaries in Libya had been transported to Syria and trained there from Libya. It was in a marriage inspired by the Americans that found local rebels working with foreign fighters in a vicious campaign of horror. As the violence spread, the locally ignored borders between Iraq and Syria began to dissolve and the conflict widened to threaten the Baghdad government. The rebels soon began to fight both the Syrian and Iraqi armed forces and had adopted the name the Islamic State of Iraq and the Levant (“ISIL”), which soon became more commonly known as the Islamic State of Iraq and Syria (“ISIS”). Former presidential candidate John McCain from the USA willingly met with this group during 2013 during much of the transformation. He has been famously photographed with leaders of both the ‘Free Syrian Army’ and its ally, the Northern Storm Army which had mutated with ISIL later that year. Shaking hands with the ‘moderate’ leader who so publicly consumed the heart of an unfortunate Syrian solider. When the West was romancing the idea of the Syrian rebels to the world, Northern Storm was cited often favourably as being a movement of secular virtues. 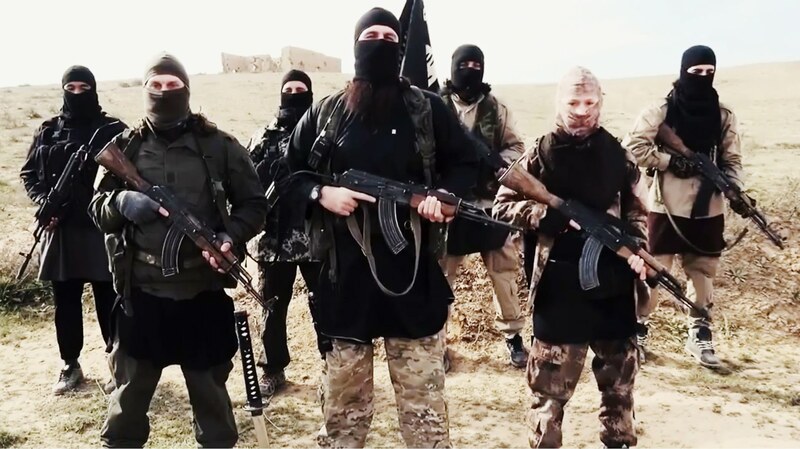 Even up until recently when it was claimed that they were fighting ISIL, in reality however they were fighting alongside ISIL and many of its members soon became a part of ISIL. The Syrian Army was for the most part having some success against the rebels, that was until the United States began to support the rebel cause with arms and training. Not to mention by introducing foreign fighters into the region allied with the threat of Western aerial attacks on Syrian Army positions, the Syrian Army began to lose steam. The Syrian Army offensive was for the most part checked and stopped for fear that an American lead air mission would cripple it and inevitably lead to an Allied invasion. This was at the time when the Rebels were being sold as the heroes of the region, the heroes of Damascus. Perhaps if the United States had not intervened directly or indirectly via rhetoric the ISIS threat would have been nullified. After fighting a terrible civil war of such a nature the regime of Bashar al Assad may have considered reforms so as to satisfy his populace. But this is speculative history now as the calamity of the region is ongoing. Regardless of this both the Assad regime and ISIS are terrible entities which have committed terrible crimes and atrocities against those unfortunates within their deadly and oppressive reach. Picking a side is a cynical and morally vacant exercise of realpolitik. The true nature of ISIS has become apparent, its earlier crimes were being hidden and concealed by those very interested parties who now seek to fight it. Its creation in no small part was due to those very people who now wish to widen the war against it. Just as this crisis is of the most apparent importance because the apparent dangers threaten us all, or at least that is how it has been sold. Just like those prior crises and enemies of the past for the most part they are a direct causation of policy, intervention and picking sides in terrible conflicts where each party is abhorrent and oppressive. Even now as the theatre of the war on ISIS continues, the air strikes have been more or less for media effect than actual battlefield effect. The targets being empty sites, of little tactical value and in some cases they have been against Syrian Government infrastructure. Perhaps the air strikes will go after higher value targets as far as ISIS is concerned but for the most part it is seemingly more about being seen to do something, too little too late. Ignoring all of the above mentioned, why is it that a nation like Australia, a population of 22 million isolated in the Southern Pacific ocean, beneath the East Asian land mass, so far removed from the Central Asian region known as the Middle East, should see itself so anointed to intervene in a confused and violent civil war between two ‘evil’ forces. Much of the calamity and hatred in these regions so removed from most of the West in both culture and geography is due to the very fact that so much interventionism has occurred there. From the early days of colonialism, through to the attacks on local regimes, the manipulation of regional politics, the propping up and maintaining of dictators to the support of such regimes. Right up to the outright invasions in the name of hegemonic self interest. Australia not only risks extending its small defence force into wider wars of abstract objective, it also seeks to alienate itself both regionally and internationally thus creating and generating further threats and ‘terrorists’ of tomorrow. Setting a positive example through trade, tourism and leading a principled life of cooperative non-violence is by far a gentler and more superior way of promoting one’s way of life. Exporting peace is by far more beneficial to all concerned than bombing the democracy into foreign peoples in the name of deadly humanitarianism. Remember how one felt after watching the twin towers collapse, how helpless and inspired to seek vengeance one felt. Recall what it was like to watch an innocent human being have their head cut off crudely with a short knife before the entire world. It generated a sickness from within, a need to do something, an impulse to react. These are the common and genuine reactions to tragic and terrible things, most often when done to ‘one of your own’. These impulses are not unique to you and me. They are widespread. Now imagine how you would feel if you pulled your limp infant’s corpse from some rubble, killed by a missile fired from afar or you saw your neighbours so savaged by the soldiers supported economically and materially from a great foreign power. Would you too not find some vile hatred coming up from deep within you? Imagine how you felt when it was strangers on the computer or television screen who were suffering, now suppose it was your homeland, your neighbourhood, people you know and love that this was horror was harming and you saw and felt it all first hand. This is why many of these people hate ‘us’. Not because of some imagined clash of civilisations, whereby the end game is a global caliphate. With every dead child or bombed house Western forces give radical elements more recruits. This is no justification for the cycle that is terror, it is however an attempt to rationalise and find reason within the firestorm of irrationality and to appreciate from where this toxic vengeance comes. It has been for the most part of the century the Anglosphere operating with wider arrogance in various regions on this earth. Conducting itself with an omniscient presence and ignoring the suffering beneath its own self determined importance. The self perpetuating illusion is that ‘we’ are ‘welcomed’ and ‘needed’. Otherwise darkness and barbarian violence would take over. And yet whereever we have intervened and operated, such a consequence has continued to emerge. Despite our repeated self important jingoistic infatuations we continue to ignore the reality that the Anglosphere and its allies are a minority on this earth. A relatively new minority to history at that and our impact, while sometimes positive, has also inflicted great harm. There is a resentment for this harm but also because of the absolute arrogance in which it is inflicted and is at home decelerated as being a benevolent act. As mentioned above in the examples of recent times, the blowback is ever present and the reactions to ‘do something’ are also ever present. So long as ‘we’ continue to see the world as our beat to walk, and we seek to impose our own values and ideals upon the worldso shall we find within it elements, however violently deluded, that will rise up to harm us. The repetitive policy (which extends even beyond the few mentioned examples) of supporting violent and radical groups in a fight against an established enemy, simply because it is, to use a cliché, ‘an enemy of my enemy’ is a continually flawed and dangerous action. It perpetuates not only the violence against the innocent but also leads to future enemies. This recent incarnation of terror and violence is not a new phenomenon, nor is it exclusive to Islam. Islamic ideology has only found itself immersed in much of the players because of the regions in which the Anglosphere is operating. Islam has become an identifier for the people, a cultural and ideological focus by which to find both strength and unity. Theological jingoism is no different to the nationalism which is so naturally celebrated at home here in Australia. The only difference is that the environment in which we live is stable and without real horror and such identifiers are not used as a rallying point for radicalism or vengeance politics. The past has shown that the Irish Republican Army (“IRA”) were quite capable of violent misery in their attempt to fight off the occupying British. Just as Euskadi Ta Askatasuna (“ETA”) were in their bloody war against the Spanish, who like the British in Northern Ireland, found themselves occupying the Basque land of Northern Spain. These two Catholic terror or liberation groups, do not represent Catholicism. Just as ISIS does not represent Sunni Islam. The Catholic church had often given locally the support to both of these groups. Does this condemn all of Catholicism for the sins of these militant few? Could one suppose that Universities were a breeding ground for violent terrorists out of the lessons learned during the 1970s when Left leaning violent groups from the USA, Japan and Europe waged horrible bloody campaigns of kidnap, executions, bombings and airline hijackings. The 1970s were by far more violent when it came to terrorism and it was by far more diverse in the regions affected and types of terror groups which were operating. It seems however that history has been ignored and the sole focus has been on the ‘new’ Islamic terror of the now. The 1970s alone was a decade of explosive violence as far as ‘terror’ went from the Popular Front for the Liberation of Palestine’s (“PFLP”) savage murder of Jewish athletes in the 1972 Olympics to the bombings and assassinations across Europe by the elitist left wing student classes. The hijackings of various air liners from the Japanese Red Army, Italian Communists, Palestinian Liberation Organisation and West German left wing extremists which changed the way the world flew. The United Kingdom was feeling the consequences of its policies in Northern Ireland as the factional violence found an explosive battle ground in England itself as the IRA expanded its war with car bombs. Australia too experienced a spate of bombings throughout the 1970s, a decade of terror never to have been experienced on Australian soil before or since. From the Hilton hotel bombing to the bombing of the Israeli Consul General’s office in 1982, the decade was terrifying for the nation. If any decade or brief period could be defined by terror then it would be the late 1960s to the early 1980s. A period of wide spread terrorism and organised criminal violence which attacked nearly every sort of target and was fought the world over. Yet since 2001, the popular media and our political elites have conjured up the illusion that never before has terror been this bad or of such a ‘threat’. Whereas in the past, much of the terror as was the case in West Germany, the United States and parts of Western Europe, was the result of radical uppity students bent on an ideological confused rampage of terror with little ambition other than their own self important bursts of violence. Focused on the intent of inspiring the creation of a police state within their host nations so that the proletariat would up-rise in a popular socialist revolution. The State for the most part enlisted a degree of restraint and treated these elements as criminals. Except for in a few cases, like that of Bill Ayers, who now is a tenured public university professor never to spend a day in jail for bombing the Pentagon, police stations and the US Capitol Building and killing a police officer, most of these terrorists found justice. There was a time when Carlos the Jakal or even Yaser Arrafat’s names would roll from the tongue whenever the abhorrent act of ‘terror’ was mentioned. Just as years later Osama bin Laden also would be so popularly associated with such violence. And as Arrafat would become a partner for peace, bin Laden would transform from anti-Soviet hero to Public Enemy number one. Meanwhile Carlos would be lost to mythic lore as the decades went on, all but forgotten by the collective minds of societal ignorance. Much of the rest of terror has been a response or reaction to policy, whether domestic or foreign. However putrid the response has been, it has near always been in effect blowback or unintended consequences born in the fires of colonialism or intervention in some form where it was not welcome or relevant for those in either nation. Even from within, the examples of Ayers and his Weathermen, the genesis of such groups were born out of US military involvement in South East Asia and the unpopular military draft needed to fuel the armed services for such actions abroad. They were cultural reactionaries fighting a war of violent ideological struggle. However wrong they may have been, the injustices which inspired their revolt was very real. As the Syrian- Iraq situation apparently demands outside intervention, local powers, large and powerful militaries sit idle. Turkey a nation which has waged a long war against Kurdish rebels has done nothing to stop cross border supplies of the ISIS rebels, let alone committed to any direct action. For Turkey the real enemy happens to be the Kurdistan Worker’s Party (or Partiya Karkerên Kurdistanê “PKK”) and other Kurdish groups who are fighting ISIS. Saudi Arabia, a nation with an imposing military, perhaps geared at keeping its own people in check, has also been on the side lines. If this conflict is of such an international crisis then why are the local powers, those whom would suffer the most as far as regional consequence go, sitting idle to let the Civil War flow on? In the end let’s pretend I am a Statist and I do hold faith in the State and its ability to do all that it promises. Why is it that nations like Australia and those others in the Anglosphere are so eager to secure hegemony across the world when they cannot even look after matters here at home? Why spend so much life, material and money on foreign adventures which nearly always harm those abroad, harm us here either through retribution or the fear of such, increases our police state and ultimately removes resources from the welfare state. Why should Australia send forces, however minimal, abroad when the communities in the outback live in virtual poverty with terrifying life expectancies? Not to mention the other social issues of both health and poverty which seem to find a convenient place of forgetfulness and remembrance whenever it suits the political parties and their populist rhetoric. Why is it that public officials cry about the lack of funds for schools and hospitals as they champ at the bit to send our overstretched military to fight in an offensive military action at the expense of our actual long term defence? While we shall seek to transpose a pleasant narrative upon the world assuming that our cultural template is the most perfect to follow. Our societal culture seems to forget that subjugation, oppression, violence and the actual denial of such a ‘template’ has been the signature of our policy makers over the decades. For those generational victims of such historical consequence this is neither forgotten nor forgiven. It has also been with recent intensification in the region that such memories and histories have converged with the modern realities and actions of these same Western players’ inability to value the lessons of history. It is not a case in most instances that the people on the ground living in these regions support vile and oppressive terror groups or regimes. It is a harsh reality that they are simply forced to abide by them and have grown accustomed to such. Furthermore, when the foreign ‘Crusaders’ have committed so much violence against your people in both past and present times the lesser of two evils as far as you are concerned is often the alternative with which one seeks to become aligned. The people living in such regions are not above such distinctions, just as our political elites are not either. Our entire history of alliances is based upon the assertion that one ally is a little less intolerable than a foe. It is why our culture can overlook the vile repression and outright violence of such regimes as Bahrain, Pakistan, Saudi Arabia, Indonesia or even Israel in its conduct in Gaza and the Lebanon. Those regimes deemed contemporary ‘kicking boy’ make for a convenient focal point so as to so balance our agendas on human rights, while scores of other nations, even those in such coalitions of the willing go on to violate humanity within their own borders. In the time that ISIS has beheaded three Westerners, the Saudi Arabian regime has beheaded scores more for alleged witch craft and adultery. Women are stoned to death for minor crimes and this is done publicly and before the entire world. These State executions are both condoned and considered legal by the very entities and powers which seek to punish ISIS for such disgusting acts of murder. And yet one entity is considered rogue and terrorist while the other is respected as being legitimate and sovereign. It takes the arrogant majesty of governance and a compliant populace to perform such open disregard for principled justice. It is amazing a culture can find it so vile that three Westerners are beheaded, yet ignore the thousands of local people who had already been murdered. How these three Western victims can so inspire such popular and political energy ‘to do something’ while Australians have been executed and shall continue to be executed by the regime of Indonesia. Yet our obsession on the war on drugs has allowed us to disregard those condemned in Indonesia as being ‘worthy’ of such a punishment. Whereas we find disgust when ISIS commits its own unjust executions. And while Australians are being shot by the Indonesian government for this ‘crime’ our national government sends this very regime aid money not to mention various military assistance and training, so that it may exercise its vile counter insurgency war against Western Papuans. And we so call this regime ‘friend’ in such fights against ‘terror’ while condoning one form of criminal savagery at the expense of another. It is within our cultural narrative to ignore this and simply accept it, while a non government player like ISIS can conjure up criminal charges against the three unfortunate journalists, the World loses its mind. Yet State executions and murders continue on a democidal scale with little popular dialogue. Perhaps we are the lunatics dancing around in an inconsistent circus of arbitrary distinctions while the fiends of ISIS are quite sane as they perform with their terrible honest consistency. The great crime that is and has been occurring in this region is the savagery inflicted on the civil populace, such vile acts as beheading children and crucifying families simply because of their religion or ethnicity. It is a primal viciousness which is not new to humanity but is rarely encountered by many here in the West. The vicious disregard to human life, especially those most innocent, invokes a desperate need to help. A need to help however which should not be limited to Syria-Iraq as sadly such savagery is occurring in West Africa, East Africa, East Asia and in many parts of South America. Just because it is not in the spotlight of Anglo political interests or on the mainstream news does not mean such disgusting conduct is not happening. As for those people who live in ‘Western’ nations, who are supportive and somewhat seduced by ISIS and its violence? There will always be those who are drawn to contrarian causes no matter how vile they may be. Not only that but there are also those people who use the guise of ideology as a means of exercising compulsions that are contrary to civilisation. Yet beyond those condemnations for such support, is it any further removed to condone ISIS than those who are closer to home that empathise and find romance within Nazi Germany, despite all that we know about that terrible regime and that period in history? Is it any different to those who continue to yearn for Communism despite the many failed attempts and the bloody legacy which every failed example has left? Is it any different to those who were alive and those thereafter who look at the terrible atrocities of carpet bombing civilian filled cities with both high explosives and phosphorus (not to mention the two atom bombs) as a justifiable necessity of total war. It takes a special kind of indoctrination or faith in a cause to look at the charred remains of thousands of women and children and to coolly declare that they are enemies and deserved such a violent inferno for their last terrible moments of life. A rationale being would call this in itself terrorism or inhumanity but I fear it is very human to do this to others. Ultimately was it terrorism when Jane Fonda went to Hanoi to lecture American Prisoner’s of War as they sat in their prison cells suffering in torturous conditions? Or was it merely inconsiderate self righteous dissent on her part? In the end I suppose according to the popular narrative, Iraq was about weapons of mass destruction right? Libya was because of human rights violations Syria was because Assad was using chemical weapons against his civil populace? It does not take a dark room or a nest of conspiracy theorists to conjure up the various reasons for continued Anglo interest in the region while disregarding in practice the many other atrocities the world over. The reality is this. Violent and terrible groups and regimes will continue to thrive and escalate their horrific conduct so long as power players in the world, namely our national government and our powerful allies, support them or intervene in regions whereby allowing reactionary elements a ‘conventional’ fight. Perhaps at the heart of it all is that our collective cultures have an inherent interest to fix a job not done properly the first time. Yet there are so many jobs poorly done, to repair what was created and caused by our policies. Yet that would seem perhaps too noble. Ultimately the interest in this region and in fighting ISIL is merely a means of maintaining stability as far as Western hegemony is concerned. Iran is forever being marginalised and with the potential toppling of their Syrian allies it is a crucial move in a cruel geo political chess game being played with thousands of human pawns. The impulse to ‘kill all Arabs’ or to ‘blast Islam back to the 7th Century’ is a reactionary impulse to absolute irrational violence. The cycle shall only continue in a perpetual bloody decline of reason and innocence. Sending more Australians to be led by a US military mission will only add fuel to a volatile fire. Outside intervention both recently and a century past are what has led to these terrible moments in time. And doing more of the same shall only lead to more terror and horrid consequence to those yet born, who will grow up on soil so bloodied and suffer beneath the oppressive shades of a past beyond their control. The present however is in our hands and the inevitable blow back and unintended consequences of tomorrow is incalculable but given the endless stacks of empirical evidence resting upon the innocent bodies of so many it is foolish and sociopath not to consider such facts. It is perhaps the peak of sheer arrogance to assume that every problem can be solved the same way over and over again with the violent repetition of a lunatic’s disregard for human life.